There seems to be a trend in the indie gaming scene these days. That trend involves world creation, community interaction, and character progression. Games like Minecraft have punctuated these concepts, and have gone on to be tremendously successful. 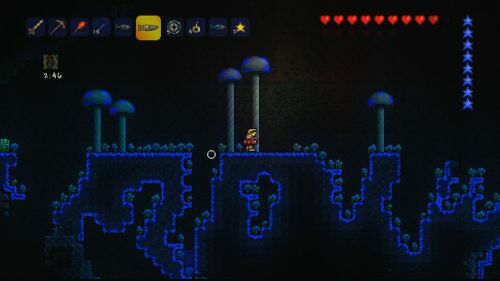 Terraria is a game that also takes these concepts, but presents them in a pixelated 2D world. It evokes many genres, primarily sandbox, creation, action, and metroidvania. Many will be quick to call it a 2D Minecraft, and while they may be partially correct, it is much more (and less) than that. Terraria is a game of progression. You will find yourself thrust into a hostile yet charming 2D world where you are left to fend for yourself. Should you elect to do so, you can play a tutorial that will outline the basics of survival. There is no true story to Terraria, only the endless drive to make it past another night. You will gather resources and build a dwelling to survive the first night. In this way, you may think that the game is basically a Minecraft clone. Later on, you will discover that the emphasis is not on creating a world, but rather item progression and exploration. You will quickly want to start mining and get to the nitty-gritty in Terraria. You will be rewarded often for your efforts. Veins of ores and precious minerals are quite common, as are pots that contain healing potions, money, arrows, and other items. You will occasionally find chests that have actual items that seem straight out of an SNES RPG. You will become addicted to exploring the depths, eager to find endless treasure. Along the way, you will fight many different monsters, in a quest to find more treasure, relics, and gear. There is a great sense of progression with Terraria, and it is the primary motivating factor of the game. In this way, the game is more defined than Minecraft. Unlike in Minecraft, creative elements are only a means to an end in Terraria. You will quickly realize that your dwellings seem lifeless. As you build up your home, new NPC’s will come to live in the various rooms you fashion. They peddle goods that can be bought with the coins from your expeditions, and sometimes drop a line or two of conversation. The majority of your time will be spent underground, and you rarely, if at all visit your house. That is because the house is simply a place to dump your treasure and coins, and house an NPC. Customization of the dwellings is not the primary focus of Terraria, it is simply an element of it. Page created in 0.3895 seconds.